There are two things you must do while in Dingle, says Bennie our host at Bambury’s Guesthouse. She knows that we’re passing through rather quickly and points us toward Dingle gold. First, the loop around the Dingle Peninsula, and second, the road that will eventually take us toward in our northerly direction of Tarbert, Connor Pass. 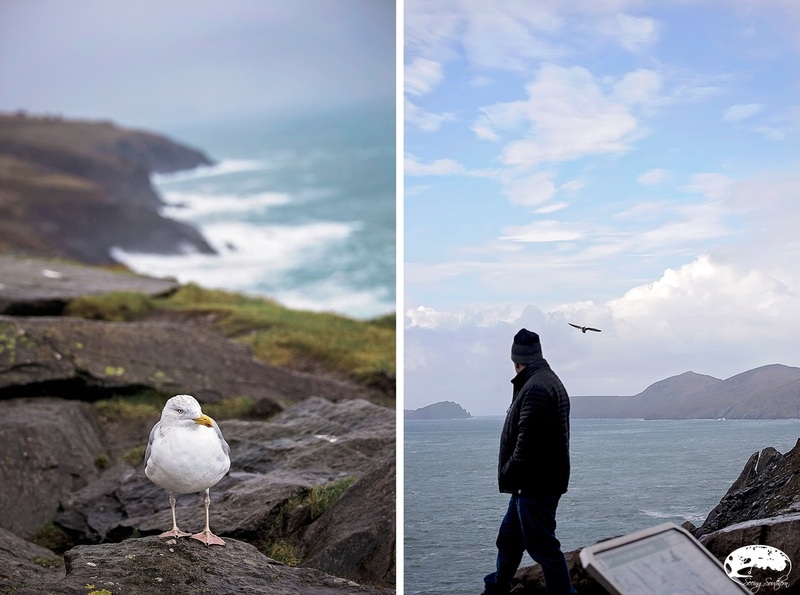 We have heard magnificent words about Dingle from many of our travel colleagues, so we’re expecting breathtaking views and a true taste of rural Ireland. National Geographic once concluded that it’s “the most beautiful place on earth.” We find out that we are not disappointed. Once again, we move down Strand Street (its main thoroughfare) along the marina front, with its row of multi-colored businesses standing as the inland’s shelter from the sea. The loop will take us to Slea Head along the Wild Atlantic Way, the western most point of the peninsula. Along the road, we stop for photographs, even through a bout of blasting hail, we grab a few shots. But wait - just five minutes longer, there is sun and a rainbow. The small winding road flanked by stone fences lead us onward. 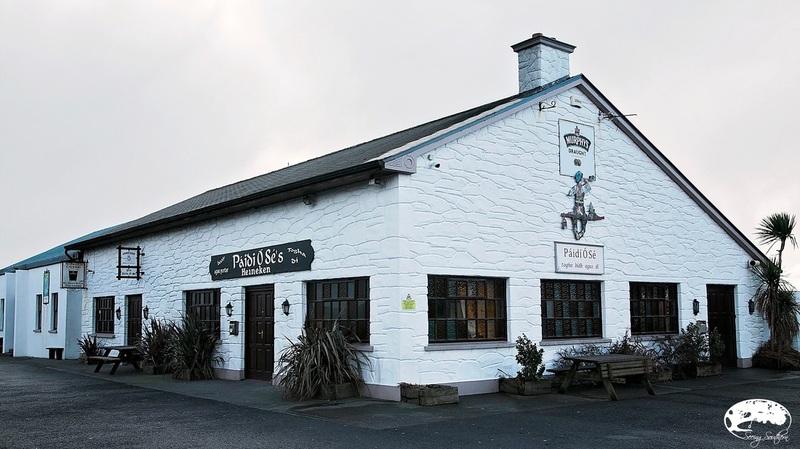 At about 8.6 km from Dingle, we see Paddy O’Shea’s pub, winner of eight all-Ireland football titles for Kerry; he has retired to the pub life. Further along, there are Raths, circular mounds which basically look like elevated hedge; locally called “fairy forts” for they believed that fairies inhabited. Although we can't get close, we wave their spirits in our direction. Further along, there are stone igloos, clustered together, looking like bee-hive huts. In the distance behind the reeds, the home used in Far and Away. Another 10 km, the crucifix at the point of a sharp curve tells us we have reached Slea Head (Ceann Sleibhe). In the distance, the Blasket Islands. From this point, you can see the ruins on Blasket of a few homes where people once lived. Today, no one is there save the few tourists that take the ferry to see what life was one like there. Back on Slea Head, patches of land move up the hillside while sheep roam the steep pastures. Before us is the village of Dunquin with a few homes, many abandoned. Again, Hollywood’s pulse is here; Ryan’s Daughter. Truly, one of the more spectacular views of our journey. In the watery distance, we see the Sleeping Giant just off the coast. The cold is pounding against our core, so it’s time for a break. During the winter, many shops/museums/cafes are closed. In Ballferriter (Baile an Fheirtearaigh), we find respite. At the gallery of Louis Mulcahy Pottery, we discover beautiful Irish pottery and a warm café. I know when I return home, I will revisit this potter. We are rejuvenated with lattes and brownies. Moving on along the peninsula, our next step is Gallarus Oratory, built 1,300 years ago as an early-Christian church. During the high tourist season, you’ll pay 3 euros to park, plus you’ll be competing with tour buses. Today, there is no one here to take our money; our visit is free. Shaped like an upturn boat, the stone-structure remains waterproof. A simple arched window provides little sunlight to the wall where the altar would have stood. Only about 10 people could fit in its small area. Your imagination works overtime, wondering about the men who stood in this tiny space. What were their words? How did they worship? How did they know to do this? Moving forward along the road, we find the ruined church of Kilmalkedar (Cill Mhaoilcheadair). It was the Norman center of worship for this end of the peninsula. 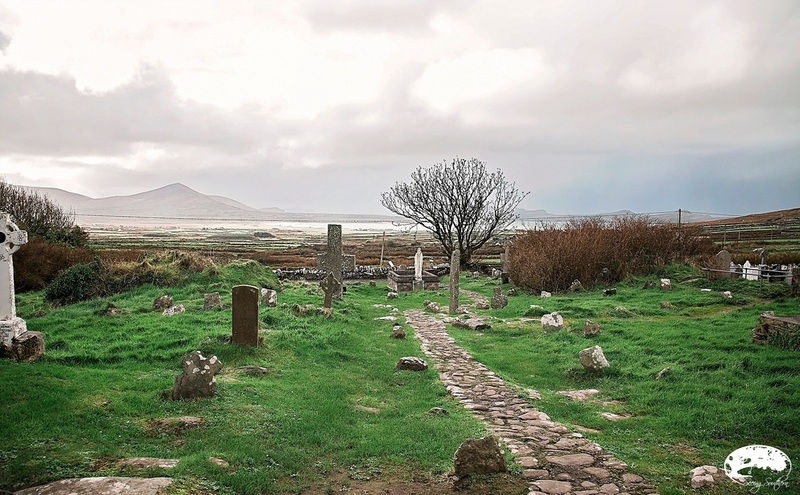 The Irish Romanesque church is surrounded by a dense graveyard. As nighttime is approaching (darkness rolls in by 4:30 each afternoon), we head back to Dingle. It’s time for sweater shopping, and we find two beauties at the Dingle Woolen Company. Next, we cross Connor Pass (over a series of mountain ranges) which offers us mountain views, sharp turns and one-lane roads that will take your breath away. Just the thought of meeting tour buses here (a given during high tourist season) leaves chill bumps. Luckily, Len is mastering the driving part of this adventure. I simply sit in the passenger side and gasp, a natural reflex when I come within inches of a cliff or stone walls. Avoiding an additional 80-miles, we head toward Tarbert, catch the 20-minute Shannon Ferry, and head toward Doolin in County Clare. We are praying for good weather tomorrow, at least low winds, in order to see the Cliffs of Moher. Those we have met in the last couple of days have told us of its closing; we have fingers crossed. In the dark, we find Doolin, a city which rises out of the darkness and assuredly, has profited from the hikers and visitors to the Cliffs. 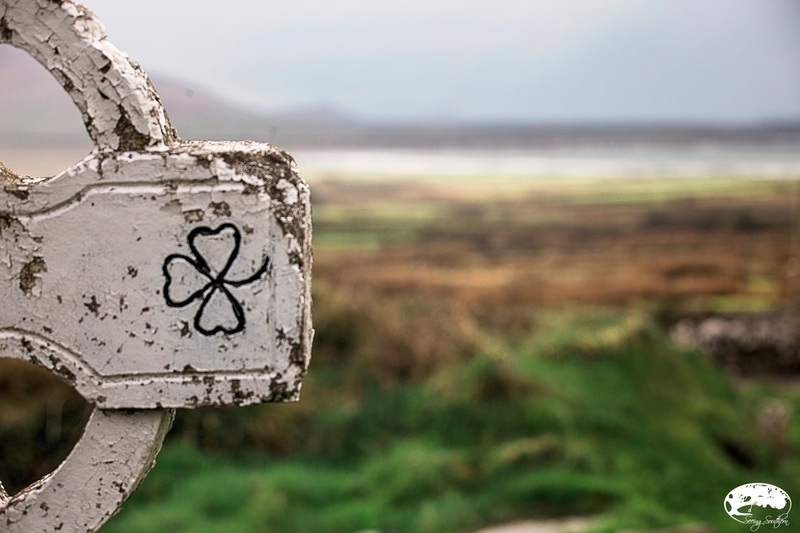 We check in at the Hotel Doolin, aggressively in the midst of renovations. Exhausted, we ask our usual question, “Where’s the best pub in town? We want bar food.” “McGanns,” without a pause. “They have live music tonight.” We erupt into our happy dance. We and other Americans from Boston and Milwaukee invade McGann’s Pub, filling up the intimate room. The fireplace is glowing and the jonquils on the dark wooden tables allow us to forget the bone-chilling cold just on the other side of the door. After my fish and chips and Len’s beef stew, we settle in for music. At 9:30, two men and a woman stroll in, asking about sound, moving the table beside us to their liking and begin taking out their instruments. A violin. Irish Bagpipes. A bouzouki. The sound check is intriguing; the show, pure Irish. We remain for one set for that’s all our bodies would allow. Between songs, the three carry on their own conversation, totally oblivious to those of us who can not take our eyes of them. A hearty “f***ing day” was deciphered quite frequently in that thick Irish brogue. Friars Green with Blackie O’Connell and Cyril O’Donoghue. A souvenir purchase which will turn to traveling music tomorrow. It’s lights out at Hotel Doolin. Dingle holds all the charms of which previous travelers have told. Don't miss the Dingle Woolen Company - right next to John Benny's - and find your very own gorgeous wool sweater. Mine is white with buttons at the neckline - what I always imagined. It's Paddy O'Shea's pub along the southern drive on the peninsula. Come to find out, there's lots of Paddy O'Shea's pubs around the world. Len is excited; I have no clue, but I will celebrate anything that serves Guinness and promotes football. Notice the earthen rise in the field (lower left). To the Irish, it's a fairy fort dating back possibly as early as the Iron Age. Quite possibly, the most beautiful view of our journey. In the summer, we're told, these narrow roads are filled with tour buses fighting for their turn on the road. Tourists hover and cover every inch of this area. What a shame, I say. 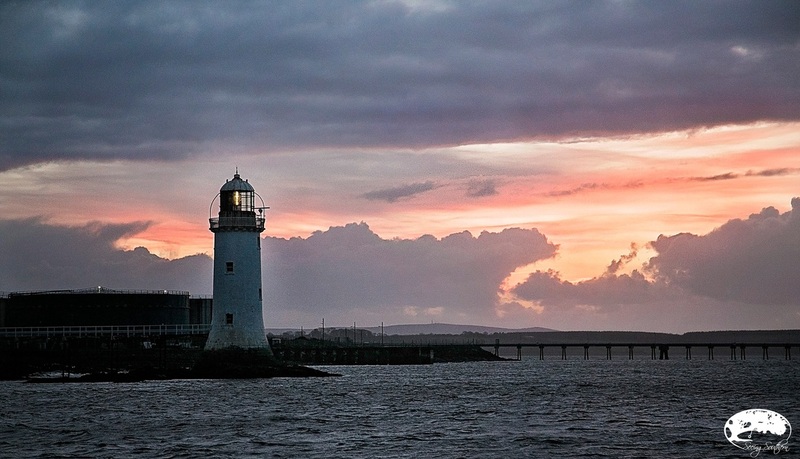 Our January journey was as Ireland should be experienced, with time to savor Ireland's beauty. At Slea Head's point is the crucifix; across the water, the Blasket Islands. An early Christian site that is built entirely of stone. It is estimated that it could have been built as early as the 700 AD. Its architecture stands the test of time, without restoration or repair. It remains watertight today. Historians tell us the church was built in the 12th century and was thought to be modeled after Cormac's Chapel on the Rock of Cashel. Crossing the Shannon Estuary between County Kerry to County Clare. One of the absolute best nights of our week abroad - You would never know that in the middle of nowhere, musicians gather in this small pub and bring their bagpipes to life. Blackie, Cyril and Geraldine made us wish this was our every night spot. And if you need a place to sleep, well, McGann's has a room for you. Legend has it that here in Doolin, J.R.R. Tolkien was inspired to write Lord of the Rings. One thing we've have learned; there's a story for everything, and everyone is true.